Hailing from Varna, Bulgaria, on the coast of the Black Sea, Svetlin Velinov has illustrated more than 100 cards for Magic: The Gathering since he began working with Wizards of the Coast approximately five years ago. Nominated for the prestigious Chesley Award from the Association of Science Fiction & Fantasy Artists, Svetlin has brought a distinctive vision to the game that has introduced players to artistic influences from Eastern Europe. Another hallmark of Svetlin’s artwork is the uncanny ability of Wizards’ art directors to pair Svetlin’s illustrations with some truly inspired flavor text. (Sample: “Nothing impresses goblins more than something that’s bound to kill them” on the card Furnace Celebration). 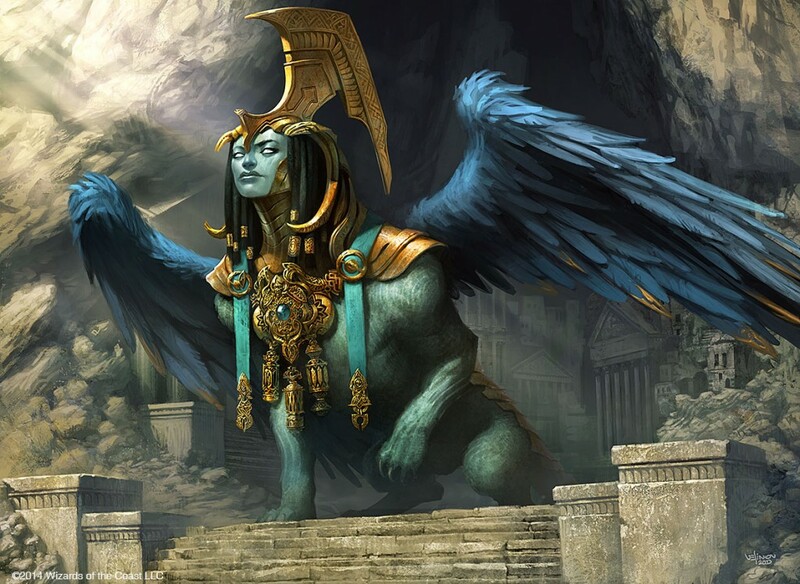 This, coupled with a healthy sense of humor in the pieces themselves, has resulted in a portfolio of work that has given players a look into the lighter side of the Multiverse, in addition to the supernatural (Obzedat, Ghost Council), the horrifying (Phyrexian Swarmlord) and the monstrous (Niv-Mizzet, the Firemind). 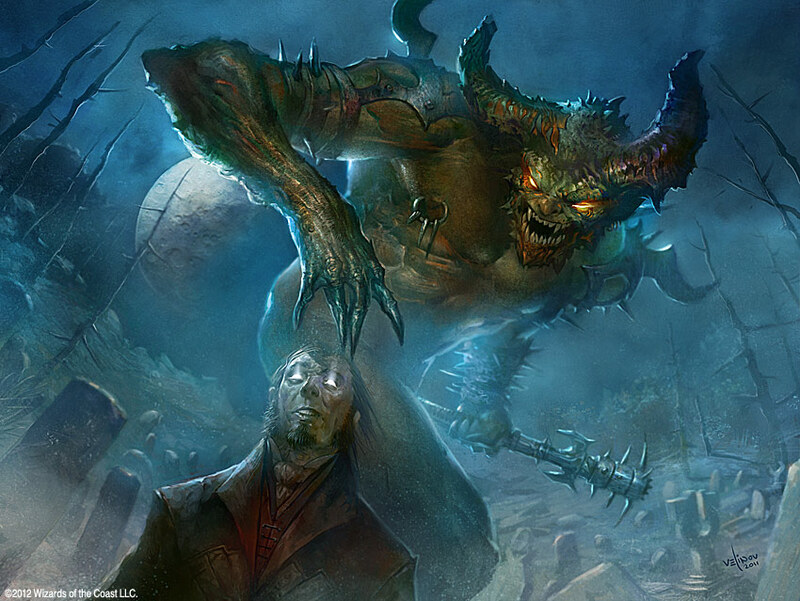 With the release of Svetlin’s alternate artwork for Disdainful Stroke as February’s FNM promo, Art of MtG corresponded with the artist from his home in Varna to talk about his work. Art of MtG: I’d like to start off with a very important question. 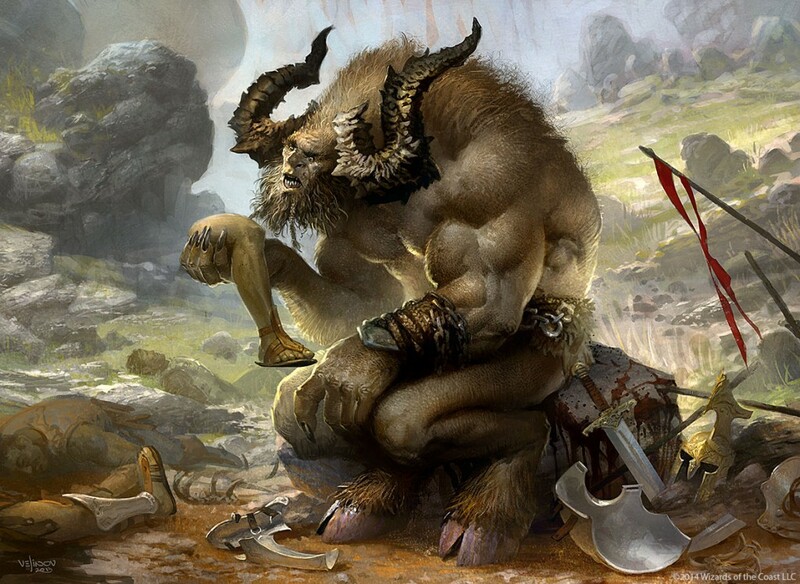 You did an illustration for Journey into Nyx called Pensive Minotaur. What, exactly, is that big guy thinking about? Svetlin: That seems to be the most interesting part: What exactly are his thoughts sitting in the middle of this bloody massacre? The illustration has a slight parody flavor, and the reference to “The Thinker” by Rodin is quite clear. Today I accidentally stumbled upon a film about Picasso, where one of the artists mentioned that if a minotaur wanted to stay alive, he would have to eat two virgins a day. Probably, my minotaur is thinking about the fact that life passes so quickly and irreversibly flies away. The illustration depicts the obvious winner of the battle, but there is not a virgin among the soldiers, so his fate is also tragic and predestined. This may be a good explanation of the situation, but you can always have another approach. Different versions of the story can be developed, and that is the essence of being an artist — asking questions rather than giving answers. 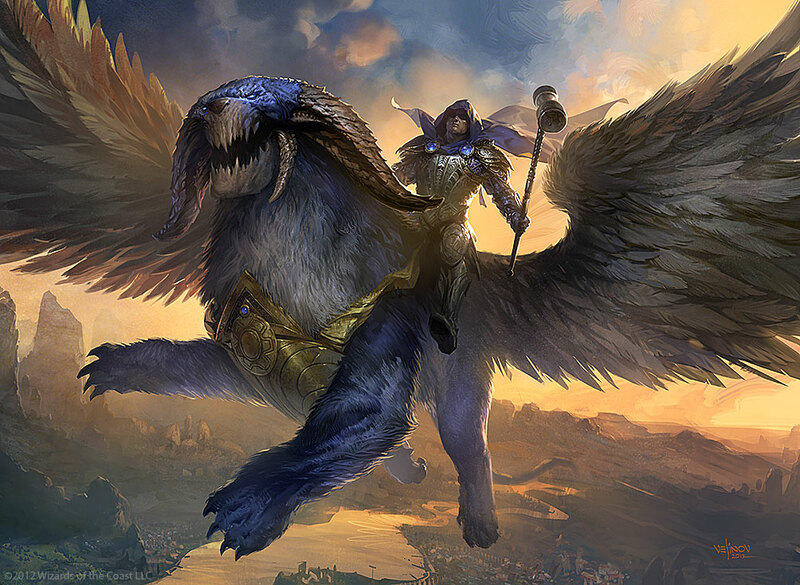 Art of MtG: Actually, in going through your gallery of cards, it’s clear that a number of your illustrations have a wry or humorous element to them. 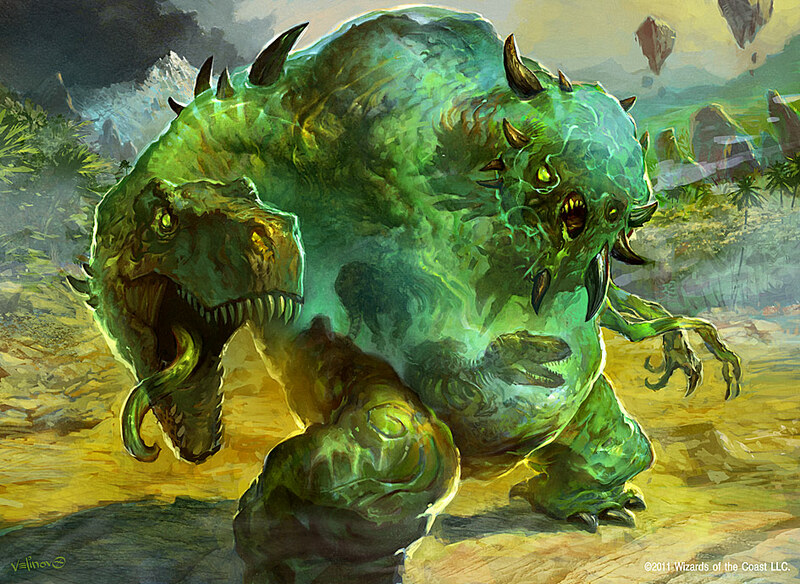 I’m thinking about Research Assistant and even The Mimeoplasm, which has the head of T-Rex for one of its arms. Why do you think it’s important to work humor into your artwork every now and then? Svetlin: Indeed, the number of illustrations I’ve done for Magic has swelled quite a lot over the years and has passed 100 cards. Undoubtedly, elements of irony and humor are present in some of my work and largely characterize my style. It becomes somehow spontaneous, like the creative process itself. I have always relied heavily on intuition and my senses to lead me throughout the process, and I have always opposed the mechanical transfer of technical skills onto a white sheet. I believe that is what makes an artist distinctive and recognizable. If this gives originality to the characters I have painted, it means that I have given them life and personality. From another perspective, elements of humor and irony in my work are a clear sign of the pleasure of painting. This is something I never want to lose! 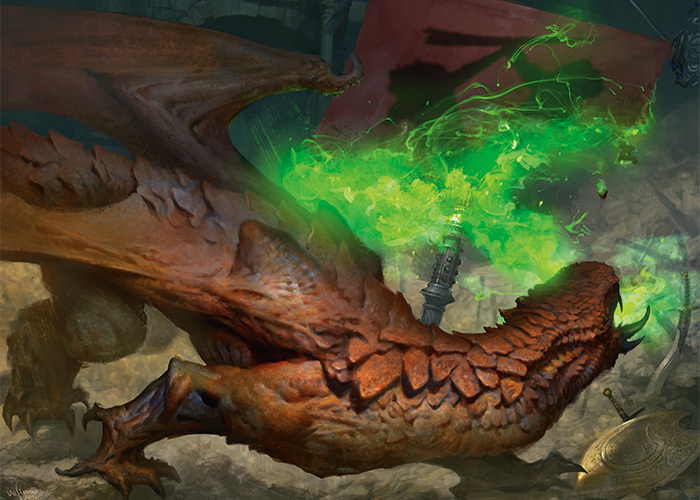 Art of MtG: Your art is featured on February’s FNM Promo — Disdainful Stroke. Tell us a little bit about your approach to this piece. 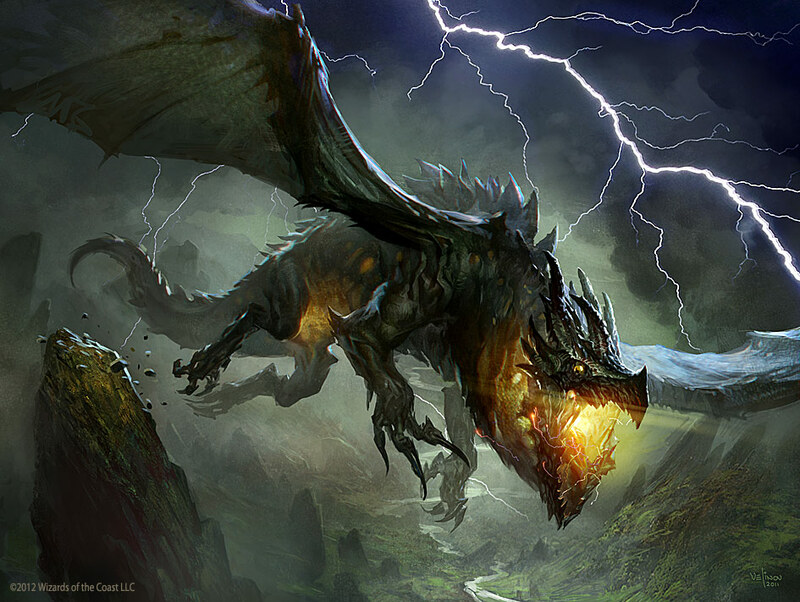 The dragon in this illustration is of secondary importance, which was the main challenge in this case. Regardless of his presence, the focus is on the destruction of the enemy flag. I like to illustrate dragons, but in this case, I had to shift the focus from the agent of the action to the action itself and its outcome. Therefore, the dragon has turned his back to the viewer to capture the effect of the action. Of course I had my revenge, as I paid due importance to the development of the light and played with the shapes and volume of the dragon anatomy, which helped not to lose its presence. I recently received my art proof cards, and I can say that it looks really awesome in foil! 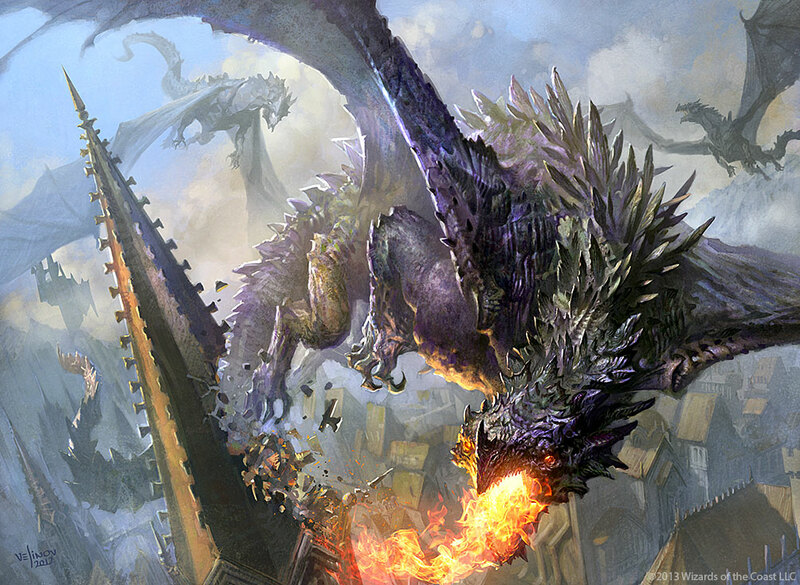 Art of MtG: You’ve illustrated a number of dragons for Magic over the years, including Noxious Dragon for Fate Reforged. Do you have a favorite? One dragon that is still among my favorites is Thundermaw Hellkite. This illustration brought me a Chesley Award nomination in the category of Best Gaming-Related Illustration. This makes me part of a circle of artists whom I have always admired and, if I’m not mistaken, I am among the few artists from outside of North America to have been honored with such a nomination, which is an achievement itself. That’s why this illustration is important to me and will always be one of my favorites. The development process itself was also interesting and challenging because it came at the last moment. My art director asked me to help with the illustration because another artist was unable to make the deadline. We had to react quickly because the deadline was already knocking on the door. The illustration was done in one day. Art of MtG: That’s really impressive to have done that in one day! You know, in addition to dragons, you’ve also illustrated quite a few goblins, as well as sphinxes and cat soldiers, to name a few. Are there any creatures that you’d like to illustrate that you haven’t had a chance to do yet? Art of MtG: As you mentioned earlier, you’re among a small fraternity of MtG artists from outside of North America and an even smaller group from Eastern Europe. Can you tell us a bit about your artistic influences? I certainly understand the advantage to having the majority of artists working on the game from North America. This is something absolutely normal, as [the United States] is the home of Magic. In recent years, however, there has been a kind of opening of Magic to artists outside of North America, which further enriches the game, bringing stylistic diversity and different visual tastes influenced by Western and Eastern European traditions and approaches to art. I believe that the players and the fans are increasingly starting to appreciate not just a strong card, but also the very art attached to it; to comprehend how the hard work and talent of so many artists is synthesized on so little space. I feel really satisfied and happy to be part of the artistic team, which has been responsible for Magic: The Gathering being so popular and successful over the years. 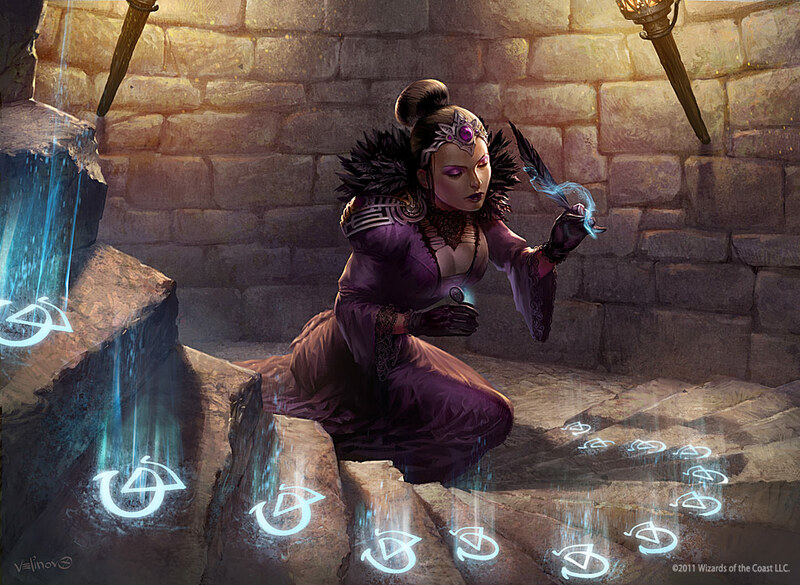 Art of Mtg: Can you give us any clues as to what you’ll be working on next? Art of MtG: How can fans learn more about you? Such interviews help, so I’m glad that you are giving me the chance to shorten the distance between me and the fans. Other ways that fans can follow my recent work are my personal page, velinov.com, and my Facebook fan page. There are many more channels, and I am easily accessible and discoverable through Google. Just browse my name.